Suit vs. Suite: What’s the Difference? Home » Suit vs. Suite: What’s the Difference? Sometimes words can be spelled nearly identically, but retain different meanings. In some cases, their pronunciations change drastically as well. This is the case with suit and suite. Even though there is only one letter’s difference in their spellings, they have separate usage cases which never overlap. They are often misused, even by experienced writers, but by the end of this post you will know how to avoid this common mistake in your own writing. What is the Difference Between Suit and Suite? In this article, I will compare suit vs. suite. I will use each word in a sentence, and then I will give you a helpful trick to determine whether you mean suit or suite. What does suit mean? Suit can be a noun or a verb. As a noun, a suit can refer to a set of clothes or one of the four categories in a deck of cards. The following sentences are examples. The producer wore an expensive suit to the record release party at the nightclub downtown. When playing the card game euchre, you must follow suit until you can no longer do so. Suit can also be used as a shorthand for lawsuit. The suit is baseless and frivolous. As a verb, a suit means to fit or work well, to be acceptable, or colloquially, to put on a uniform or set of clothes. The following sentences stand as examples. This type of work does not suit Kevin. I’ll meet you at the cider house at 7:00pm, does that suit? Suit up, boys, we’ve ladies to wrangle. What does suite mean? Suite is a noun. It refers to a set of rooms, or a set of musical pieces designed to be played together in sequence. It is pronounced the same way as the word sweet, although that word has its own set of separate meanings which do not overlap with suite. The following sentences are examples of the correct usage of suite. Right this way, my lovelies; I’ll show you to the honeymoon suite. Bach’s orchestral suites are prime examples of Baroque sensibilities. Here is a helpful trick to remember suite vs. suit. Suit and suite are both nouns, but only suit can be a verb. If you’re using the word as a verb, choose suit. As a noun, suite and suit each have different meanings that don’t overlap. The words are not interchangeable in any context. You can remember that suite refers to a set of rooms or musical pieces since both suite and antechamber, which is the name of a type of room, are spelled with an E.
Is it suit or suite? While these two words are close in spelling, their meanings do not overlap in any senses. Suit can be a noun, where it means a set of clothes or a type of card in a standard 52-card deck. It can also be a verb, where it means to fit or to be acceptable, or to put on clothes. Suite is only a noun. It refers to a set of rooms or a sequence of musical pieces. You can remember that suite refers to rooms since suite and antechamber are both spelled with an E.
If you need help remembering, you can check this article again to decide whether you should write suite or suit. 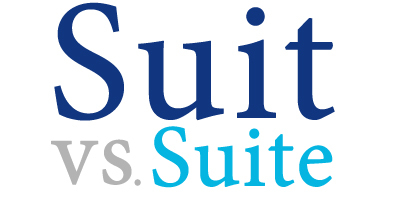 1 What is the Difference Between Suit and Suite?